It is notified that Ms. Pranita Upadhyaya, a PhD candidate, in the Department of Computer Science and Engineering, School of Engineering, Kathmandu University, will have her PhD Dissertation defense on following time, date and venue. Time : 10:00 A. M.
All interested are welcome to attend the presentation. Interested one could find the hard copy of the dissertation in the Central Library of Kathmandu University from 19 December 2016 to 26 December 2016. 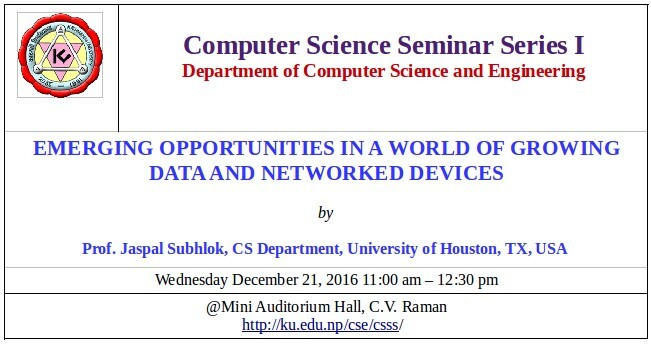 The Department of Computer Science and Engineering proudly announces the commencement of a bi-monthly Computer Science Seminar Series starting from Dec 21, 2016. The aim of the event is to foster stronger networking and collaboration as well as sharing and dissemination of knowledge and expertise with the Computer Science researchers all over the world and the Computer Science students and researchers community at Kathmandu University. For more details, please visit the following link http://ku.edu.np/cse/csss .